Owyhee County was the first county formed by the Idaho Territorial Legislature on the last day of December, 1863. Named after three Hawaiian fur-trappers that helped discover the area in 1819, “Owyhee” is an early anglicized spelling for the word “Hawaii.” The original county seat was Ruby City (no buildings in this town have survived to current day), but was relocated to Silver City in 1867, due in part to Silver City being closer to the majority of the mines in the area and sitting on a better spot upstream that made winters a little more bearable for the miners and business owners. Once the most populous county in Idaho, Owyhee county is now the least populated. The current county seat is Murphy and the most populated town is Homedale. 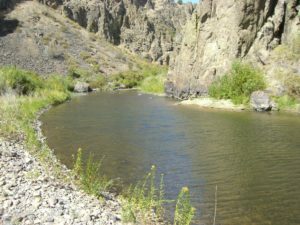 What spurred the formation of Owyhee county? Gold, of course. Rich placer deposits were found in the Owyhee Mountains in May of 1863. Before snow was on the ground that same year, hardrock mines were being planned and three towns rose from up from the wilderness: Booneville, Ruby City and Silver City. The gold and silver production of the area was so high and the boom so quick, the little south-west corner of territorial Idaho became world-famous overnight. Silver City quickly became one of the most populous and modern towns in the region. The boom turned Silver City into a town of dozens of streets, hundreds of homes, seventy-five businesses, twelve ore-processing mills and thousands of residents. With the continued discovery of deposits around the region, the populace of Silver City became so consumed with the prospect of wealth and opportunity that the town turned to violence, so much chaos, in fact, that federal troops had to be called in to squash the problem. The miners of the area worked seventy-miles of hand-dug tunnels throughout the areas of War Eagle Mountain, De Lamar, Flint and Florida Mountain. Over two hundred and fifty mines were in operation in the area. Working days and nights, the miners stashed their personal gold earnings in hidden sites around the region, never wanting to leave their riches in their communal bunking quarters. By the time Idaho became a state in 1890, most of the larger ore deposits had been played out and Silver City and the surrounding towns began emptying out. Though Silver City was never completely abandoned, it did turn into a historic relic. One of Idaho’s most famous ghost towns, Silver City was never commercialized, burned down, or pulled into the modern era. Small-scale mining continued up to World War II, but then the majority of those operations were shut down due to a combination of the poor price of gold and the old rail systems and carts needing to be salvaged for scrap metal. The De Lamar gold and silver mine pit, started in 1977, brought large-scale mining back into the area until the mine closed in 2000. It remains one of the largest open-pit gold and silver mines in the United States. Some estimate that over 900,000 ounces of gold was pulled from the Silver City area. In today’s gold prices, that amounts to around $1,530,000,000! And there is still gold and silver to be found in the area. So, what are you waiting for? 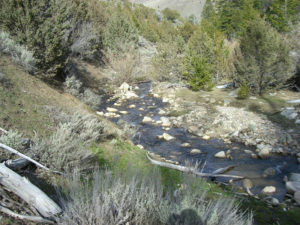 Check out our claims near Silver City here and get to work!